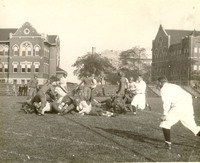 The Loyola University Men's football team takes the ball down the field, circa 1928 - 1929. The Loyola University Men's football team struggles for possession of the ball. 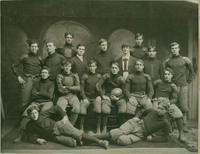 The Loyola University Men's football team gets ready to run down the field, circa 1929 - 1930.